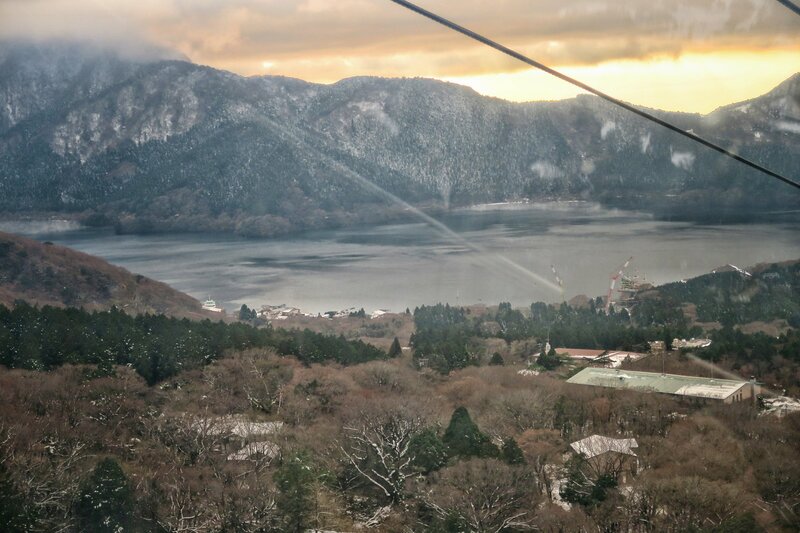 After exploring the bustling Shinjuku with the sudden snowing in the city, we took a 1D1N trip to Hakone. At first, this was meant to be a side visit to a place with onsen nearby Tokyo area. Hakone is just 1-2 hours away from Tokyo with train (few options though). 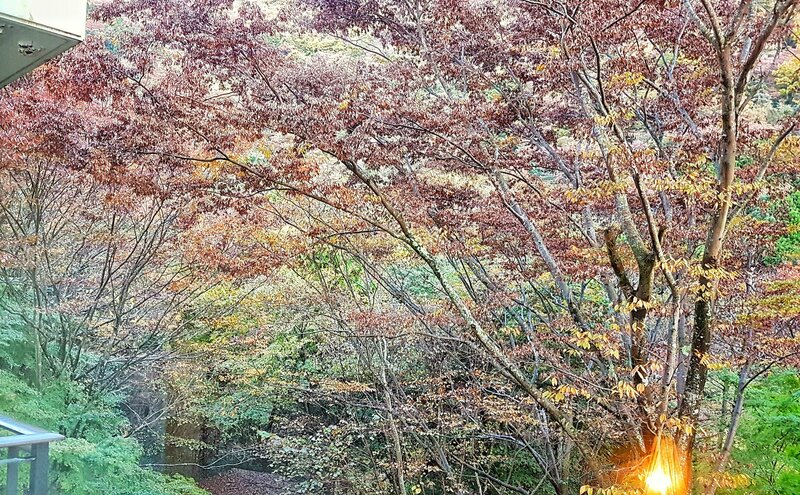 However, after that day, Hakone became the highlight of the trip, with the beautiful landscape, gradual change of autumn to snowy scenery, great onsen, as well as ease of self-touring. Try to visit Hakone on weekdays instead of weekends. We went there on Friday, it was already quite crowded, but still manageable. However, on Saturday, the crowd was much much more. Without JR-Pass, taking Odakyu train called “Romance Car” from Shinjuku station. With JR-Pass, taking JR train to Odawara, and taking local train to Hakone. Since our visit was mostly planned only about Tokyo its surroundings, we did not purchase JR-Pass. 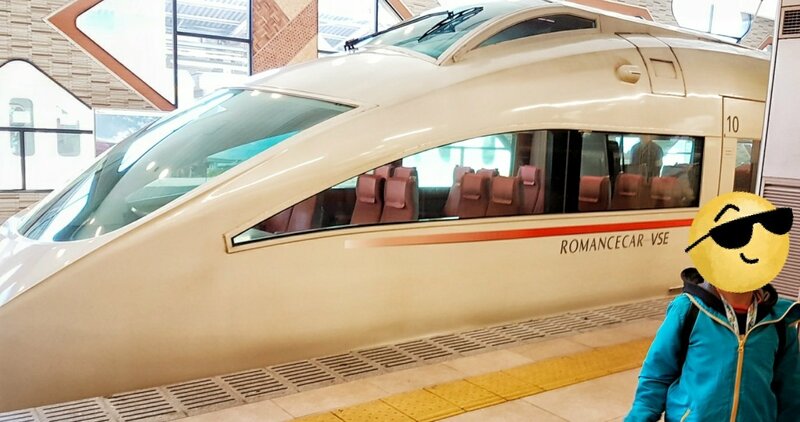 Thus the only option is to take “Romance Car”. Romance Car needs reservation, and the view between Tokyo and Hakone is very beautiful. so remember to book the seat zone called “Observation Deck” or something like it to and fro Hakone. From Tokyo to Hakone, the Mt. Fuji is at the right side of the train. Also remember to book the right window seat for this trip. For our trip, we found SuperHokuto train type is a nice train with modern feeling. fyi on the booking. For the booking and purchase, visit Odakyu website. Need not worry or rush to buy food and beverages for the journey. There are shops that sells bento and drinks inside the train platform. Further than that, they also sell bento and drinks inside the train, and the price is almost similar to the vending machine/stall, not a cut-throat type. As long as we have the Hakone Free Pass, we need not worry about the transport within the town. The pass covers even the Hakone Tozan train, Ropeway, Ship ride, Buses, etc. It is a must to have this pass when visiting Hakone. We purchased this pass in Odakyu SightSeeing Service Centre in Shinjuku station. More Info on Hakone FreePass. Would suggest, having this settled at least 1 day before taking the Romance Car, as Shinjuku station is very big, and as first timer we spent some time finding the counter and queueing. Though with the FreePass, transport fee is no longer a problem, however, do note to plan and watch the transport schedule carefully. For some end point of the trip, like moto-hakone, the bus operation there might stop be at 5pm and it was very difficult to find Taxi as well. We really had our scare of the year when we, were carrying 1 yo infant and 7 yo kid, thought that we would be stranded there in a cold weather. Luckily we managed to board the last bus to Hakone-Yumoto Station, and then took another bus to our accomodation. Based on our calculation, the shortest Hakone tour round-trip would take one half day, that is also already rushy. According to our schedule, we would reach Hakone at around 12 afternoon, it would be too rush to take train back to Shinjuku. Thus, we decided to stay for a night. Not to worry about luggages, you can put your luggages into coin-lockers in Shinjuku station, and fetch it when you are back. Thus, it is advisable to go Japan with small luggage whenever possible. Do check the coin-locker size so that luggages can fit in. There are a lot of lockers around the station, but the usage is also quite high. In the situation when all coin-lockers are used up, there is a stall in the station which accept luggage keeping or luggage transfer for a higher fee than the coin-locker. Back to the stay matter, there are a lot of hotels in Hakone. But for better and richer experience, Ryokan would be a better choice, especially those ryokans that comes with Onsen and Meals. We stayed in this ryokan called Hotel Hatsuhana. It comes with Breakfast and Dinner, Yukata for adults and kids (upon request), nice rooms with hill view, friendly staffs, and the best part would be the nice indoor and beautiful outdoor onsen. It also provides shuttle to and fro Hakone-Yumoto Station. Because we ended our Hakone-round-trip so late in the first day, we missed quite a bit. We missed the shuttle bus and the dinner. We had a great breakfast on the next day, thus we assume that the dinner would be as amazing. The dinner is planned to be missed though, we bought more bento-s for dinner on the way to Hakone. For Japanese style room, they will ask what time to “make your bed”. When we were asked those question, we were puzzled. Had no clue what it meant, we told them 8 pm. Then we went to the room and found table and tatami chairs with the futons in the cupboard. Then at 8 pm, a group of staffs came into the room and cleared the table and chairs in the room, then started preparing futons and covering them with bed linen. At that moment, we realized what “make your bed” means. We spent the night walking around the hotel in yukata, took turn going to the onsen as the infant could not dip into the onsen. Someone need to take care of her. The onsen really has magical power. We were not in a good mood after the scare of the year, still traumatized. But after the onsen, those scared, tired feeling, and all the bad feeling were all gone. Instead, we were addicted. 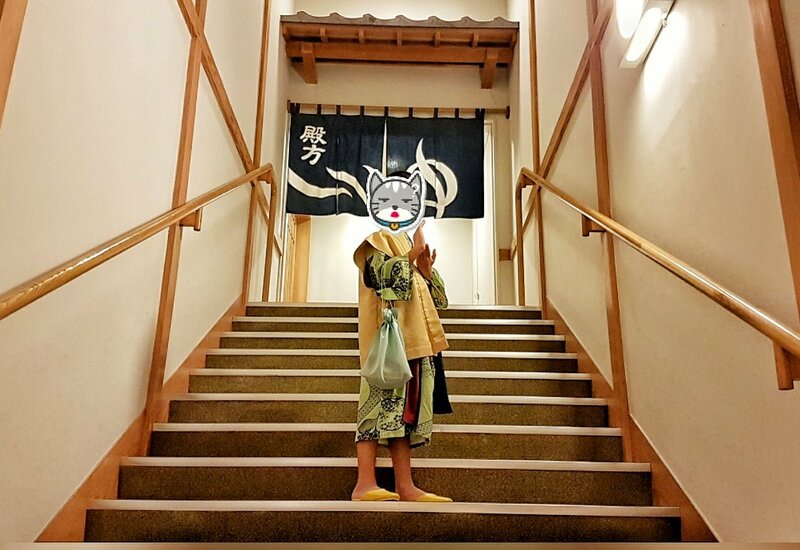 In this onsen also I first taught my boy how to dip into onsen, though he almost gave up due to the heat. In 2018, he in turn taught me how to dip into public-bath hot pool when I almost gave up haha. From Hakone-Yumoto Station, we followed the crowd, it was quite simple to follow through to the next transport. All signs were very clear from one stage to another stage. The views were also very picturesque at every stages. Kids loved the snow, this was what triggered our plan for the next vacation to Hokkaido. There are more to visit, like the outdoor gallery, shrine on the water, water playground, wine and matcha onsen, and move further and closer to Mt. Fuji, etc. Wish to come back again and explore the area from Hakone to Mt. Fuji in the future.